In heraldry, an escutcheon (/ɪˈskʌtʃən/) is a shield that forms the main or focal element in an achievement of arms. The word is used in two related senses. First, as the shield on which a coat of arms is displayed. 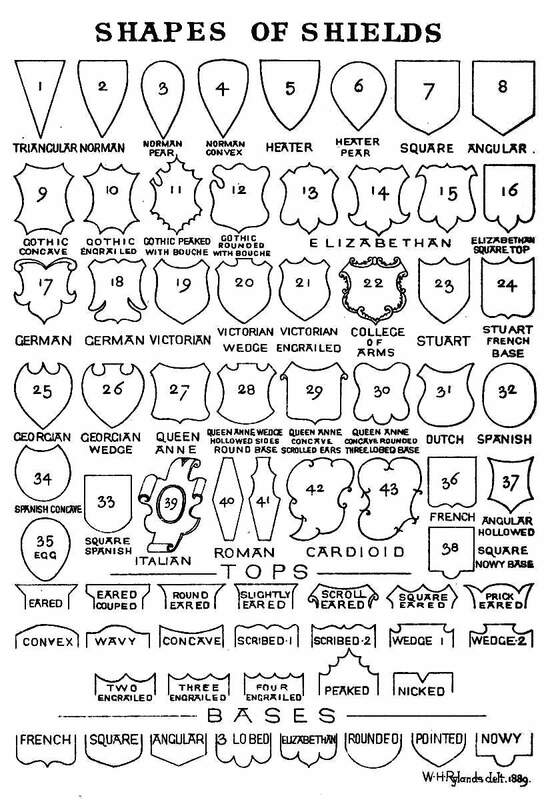 Escutcheon shapes are derived from actual shields used by knights in combat, and thus are varied and developed by region and by era. As this shape has been regarded as a war-like device appropriate to men only, British ladies customarily bear their arms upon a lozenge, or diamond-shape, while clergymen and ladies in continental Europe bear theirs on a cartouche, or oval. Other shapes are in use, such as the roundel commonly used for arms granted to Aboriginal Canadians by the Canadian Heraldic Authority. Second, a shield can itself be a charge within a coat of arms. More often, a smaller shield is placed over the middle of the main shield (in pretence or en surtout) as a form of marshalling. In either case, the smaller shield is usually given the same shape as the main shield. When there is only one such shield, it is sometimes called an inescutcheon. The word escutcheon (late 15th century) is based on Old North French escuchon "shield". The earliest depictions of "proto-heraldic" shields in the second half of the 12th centuy still have the shape of the Norman kite shield used throughout the 11th and 12th centuries. By about the 1230s, shields used by heavy cavalry at least had become shorter and more triangular, the so-called "heater" shape. Transitional forms, intermediate between "kite" and "heater" shapes, are seen in the late 12th to early 13th centuries. Transition to the classic "heater" shape was essentially complete by 1250. For example, the shield of William II Longespée (d. 1250) shown with his effigy at Salisbury Cathedral is triangular, whilst the shield shown on the effigy of his father William Longespée, 3rd Earl of Salisbury (d. 1226) is still of a more elongated form. That on the enamel monument to the latter's grandfather Geoffrey V, Count of Anjou (d. 1151) is of almost full-body length. This heater-shaped form was used in warfare during the apogee of the Age of Chivalry, at about the time of the Battle of Crecy (1346) and the founding of the Order of the Garter (1348), when the art of Heraldry reached its greatest perfection. This almost equilateral shape is therefore used as a setting for armorials from this "classical age" of heraldry, in the sense that it produced the best examples of the art. Beginning in the 15th century, and even more throughout the early modern period, a great variety of escutcheon shapes develops. In the Tudor era the heraldic escutcheon took the shape of an inverted Tudor arch. Continental European designs frequently use the various forms used in jousting, which incorporate "mouths" used as lance rests into the shields; such escutcheons are known as à bouche. The mouth is correctly shown on the dexter side only, as jousting pitches were designed for right-handed knights. Heraldic examples of English shields à bouche can be seen in the spandrels of the trussed timber roof of Lincoln's Inn Hall, London. The shape of the top, the sides and the base may be separately described, and these elements may be freely combined (Grazebrook 1890, plate I). The highly complex Baroque style shields of the 17th century come in many artistic variations. Male (shield-shaped) and female (lozenge-shaped) coats of arms in relief in Southwark, London. In English heraldry, the lozenge has for many centuries[weasel words] been particularly associated with certain females[weasel words] as a vehicle for the display of their coats of arms, instead of the escutcheon or shield, which is in its origin an object of manly warfare. In this case the lozenge is without crest or helm, again objects of manly warfare. However, for the practical purpose of categorisation the lozenge may be treated as a variety of heraldic escutcheon. Traditionally, very limited categories of females have been able to display their own arms, for example a female monarch (who uses an escutcheon not a lozenge, being unlike most armigerous females, a military commander) and suo jure peeresses, who may display their own arms alone on a lozenge even if married. [year needed] In general a female was represented by her paternal arms impaled by the arms of her husband on an escutcheon. (See Marshalling (heraldry)). In modern Canadian heraldry, and certain other modern heraldic jurisdictions, women may be granted their own arms and display these on an escutcheon. Life peeresses in England display their arms on a lozenge. [year needed] An oval or cartouche is occasionally also used instead of the lozenge for armigerous women. As a result of rulings of the English Kings of Arms dated 7 April 1995 and 6 November 1997, married women in England, Northern Ireland and Wales and in other countries recognising the jurisdiction of the College of Arms in London (such as New Zealand) also have the option of using their husband's arms alone, marked with a small lozenge as a difference to show that the arms are displayed for the wife and not the husband, or of using their own personal arms alone, marked with a small shield as a brisure for the same reason. [clarification needed] Divorced women may theoretically until remarriage use their ex-husband's arms differenced with a mascle. Widowed women normally display a lozenge-shaped shield impaled, unless they are heraldic heiresses, in which case they display a lozenge-shaped shield with the unaltered escutcheon of pretence in the centre. The lozenge shape of quasi-escutcheon is also used for funerary hatchments for both men and women. Pretoria High School for Girls in South Africa is one of the few all-girls schools that was granted permission to use the lozenge as part of its coat of arms. The points of the shield refer to specific positions thereon and are used in blazons to describe where a charge should be placed. in territorial claim, bearing a monarch's hereditary arms en surtout over the territorial arms of his domains. Inescutcheons may appear in personal and civic armory as simple mobile charges, for example the arms of the House of Mortimer, the Clan Hay or the noble French family of Abbeville. These mobile charges are of a particular tincture but do not necessarily bear further charges and may appear anywhere on the main escutcheon, their placement being specified in the blazon, if in doubt. Inescutcheons may also be charged with other mobile charges, such as in the arms of the Swedish Collegium of Arms (illustrated below) which bears the three crowns of Sweden, each upon its own escutcheon upon the field of the main shield. These inescutcheons serve as a basis for including other charges that do not serve as an augmentation or hereditary claim. In this case, the inescutcheons azure allow the three crowns of Sweden to be placed upon a field, thus not only remaining clearly visible but also conforming to the rule of tincture. Inescutcheons may also be used to bear another's arms in "pretence". [note 1] In English heraldry the husband of an heraldic heiress, the sole daughter and heiress of an armigerous man (i.e. 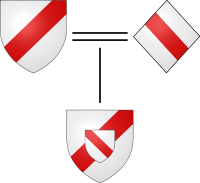 a lady without any brothers), rather than impaling his wife's paternal arms as is usual, must place her paternal arms in an escutcheon of pretence in the centre of his own shield as a claim ("pretence") to be the new head of his wife's family, now extinct in the male line. In the next generation the arms are quartered by the son. A monarch's personal or hereditary arms may be borne on an inescutcheon en surtout over the territorial arms of his/her domains,[note 2] as in the arms of Spain, the coats of arms of the Danish Royal Family members, the greater coat of arms of Sweden, or the arms of Oliver Cromwell as Lord Protector of the Commonwealth of England (1653–1659). The early Georgian kings of England bore an inescutcheon of the royal arms of Hanover on the arms of the Stuart monarchs of Great Britain, whose territories they now ruled. 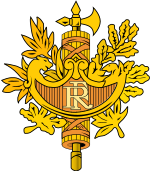 Pelta escutcheon as used in the National emblem of France. Modern (republican) French heraldry tends to be based on the pelta, a wide form of shield (or gorget) with a small animal head pointing inward at each end. This is Roman in origin; although not the shape of their classic shield, many brooches of this shape survive from antiquity. A form of pelta appears as a decoration above the head of every official on the Austerlitz table, commissioned by Napoleon for propaganda purposes. 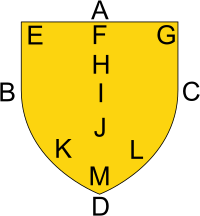 Console (heraldry), a surround or frame of an escutcheon. This page is based on the Wikipedia article Escutcheon (heraldry); it is used under the Creative Commons Attribution-ShareAlike 3.0 Unported License (CC-BY-SA). You may redistribute it, verbatim or modified, providing that you comply with the terms of the CC-BY-SA.